The time has come for our longtime and much-loved Executive Director, Billie Smith, to prepare to retire. Billie will be hard to replace, but we must move forward to find someone to lead Alliance of Therapy Dogs. Billie is planning to leave her position in August 2019, but we are looking for her replacement now to ensure a smooth transition. 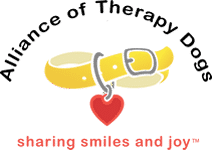 Alliance of Therapy Dogs is a non-profit organization that provides testing, certification, registration, support, and insurance for members who volunteer with their dogs in animal-assisted activities. The organization is comprised of over 15,000 members across the United States, Puerto Rico and Canada. The Executive Director position reports directly to the Alliance of Therapy Dogs Board of Directors. The Executive Director is responsible for the strategic and operational activities of ATD and supporting the board’s activities. Manage daily operations including phone volume management, banking, and bill payment. Understand when to go to experts (board members) for advice. The executive director position is located in Cheyenne, Wyoming. Please email your resume, along with a cover letter outlining our qualifications to jobs@therapydogs.com. No phone calls will be accepted.